Below I have two articles combined which I wrote in 2006. I have created a new video for my Kyi’Ra Portal members as Communion & Initiation to these articles. You will find the link to it at the bottom of the page, as it is very important that you read these articles before seeing the video. Of course, those who are very familiar with what is written below may scroll down to the link . Murry Hope, in her book The Lion People – Intercosmic Messages from the Future writes about the lion-like beings from Sirius. She calls them the Pashat. Through my akashic insights and communion with Thoth, I have written on the Lion-Headed “Sun Lords” of Sirius, who guardian the energetic capstone (Telos.Aarkhara) set over the “Eye of Ra” – a universal locus, which has been exposed to instability since the universal tear, or schism of space-time in this universal eons ago. The Telos.Aarkhara has been created by Universal Intelligences to keep this “eye” or node in balance. The Sun Lords, or a faction of them, use their tremendous energy focus to constantly re-calibrate the capstone. From the Akasha it has been revealed to me that the “star lions” of Timbavati were seeded into the then-present golden lion population by the Sirian Sun Lords through a cosmic event in the skies over Africa. This event consisted of an merkabah of pure energy coming into contact with the DNA of a specific species of lion already then present in Timbavati. 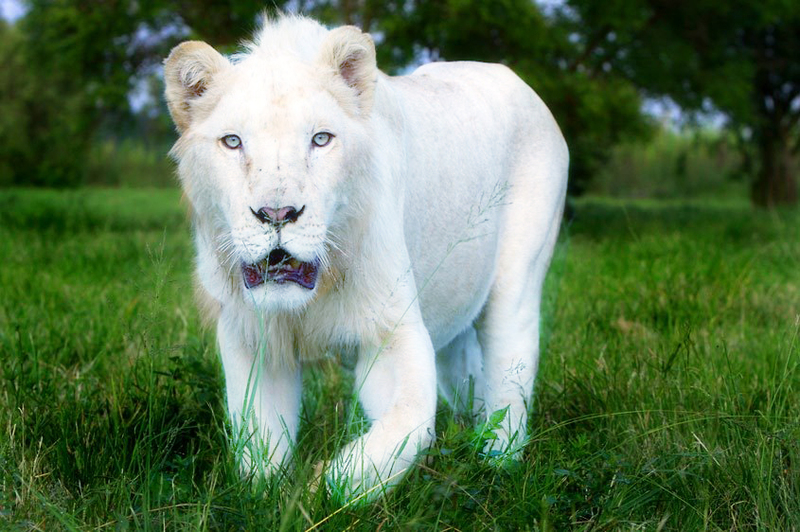 The resultant white lions are thus a product of human lions and genetically engineered Sirian lions. . . not “Sun Lords”, ie lion-human forms, but a true “lion”, yet with a bridging crystalline sequence in the DNA that will in the future allow this species to open a path for reunion with the “Pashat” strain or tribe to come once again into our midst. What purpose would this serve? The Lion Ones are savants of our future worlds who hold a key to our own evolution. Perhaps not as intimately as do the cetaceans (who are actually a branch of our past-future species), but nevertheless the Lion Ones are among us now. . . incarnating as humans and guiding us at key moments in time. In their true forms, they sing to us the song of our future potential as solar beings beyond our current star-sun. In the Numis O’m (current evolving level of our future New Earth Star) the Lion Ones are present. Their part is to generate energy and maintain stability of the matrix and many grids within it of the evolving world field. In communion with the Lion-Headed Sun Lord, Idoris, I received the following transmission. Note that all names given are for our benefit, as the communication of the Lion Ones is largely telepathic, keying off of specific guttural (yet strangely melodious) sounds. Idoris: Our history was born from the flame of Kham, a world in the 5th Universe, according to our matrix. It was on Kham that the leonine forms developed and merged with the human-like beings that were then present there. This merging was part of a greater plan to unite two golden strains of life that had long ago shared one crucible…as it is on your world between the cetaceans and earth humans. From Khan, we migrated into the realms of Sirius, to the planet Isuma. Not all of our race, which we will call here Ichatua, are “Sun Lords” this title is more appropriate for those of us who guardian and maintain the capstone over the Eye of Ra — theTelos.Aarkhara. As Sun Lords we are reconcilers of the solar emanations as they penetrate planets within our matrix, such as your earth. If you touch our matrix we may come to you in vision or Dreamtime and feed you from the flame we guardian in the sacred capstone, for we are the Dwellers on the Threshold of your cosmic being. Maia: How may we touch your matrix? Idoris: By connecting to the pure flame of the SOL’RA – the solar center of being, the Golden-White Sun. As you so intend and visualize this center it shall be made known to you. Idoris: Our plight, our purpose as Sun Lords is to reflect the Yesuarata Kominghi. The Divine Body is in the understanding of your planetary identification, the “Body of Christ”, for it radiates the Pure Flame of the Christic Consciousness through the universe and beyond. Maia: Why do you choose the leonine partial form to merge with the human body? Idoris: The leonine form is reflected in your natural world from a larger template of creation. . . that from which we as a race, arise. Maia: Tell us more about the “star lions” of Timbavati. Do you, as Sun Lords, work through them in some way on earth? Idoris: They are part of our Presence. Yet they are animals. . . creatures of the earth, as well. As they hold our Presence, so we radiate through them a vibration into the planet. Maia: As I understand it, the star lions were entirely eradicated through hunting from the wild of South Africa. Only now are plans underway to re-introduce them to the wild of the natural homeland in Timbavati. How important it is that this re-introduction take place? Idoris: It will happen as intended. Just as it was necessary for the star lions to go into the world on humankind, so it is now intended that they return to their seeding ground. Maia: The archetype Sekhmet, as a Mother-energy being of universal proportions holds the flame of the Lion Ones, for She offers us a portal into their realm, which is really an aspect of our own being. Understand that every creature on this earth is an aspect of our life expression on earth, or it would not be present here with us. It is interesting that Sekhmet was called “The Eye of Ra” by the ancient Egyptians. Her name means “she who is powerful”. I have been shown that she is represented in the Black Madonna, as one who waits to be known in the Heart of the Lion. It was revealed to me in the Akasha that Mu (Lemuria), the Motherland of humankind on earth, the divine feminine was depicted as “Mu-Lha“, The love-light breath of creation. She was seen in several different forms — each one intended to represent an aspect of her nature. One of these forms was a lion-headed woman, carrying a golden and white sphere in one hand intended to represent the Golden-White Sun or later to be called the “Eye of Ra”. In the other hand she held a dijti, which was an object that looked like a small whip with three strands attached to it. These were the three waves or universal streams that compose our working universal system. As “Tushbah” the Lion One, so Mu-Lha became a builder of world matrices, much like the Sun Lords of Sirius. Tushbah was black in color, with large golden eyes. her blackness was the void before creation and also that which is hidden until LIGHT is brought from the Golden-White Sun of what we would call “Christ Consciousness” to illuminate the All. The lion priest Mutwa revealed to Linda Tucker the meaning of the name Timbavati – “the place of coming down.” He then proceeded to tell Linda the story, which the bushmen of Timbavati consider to be authentic history, of Queen Numbi’s encounter with the star object and the Shining One. Numbi, a Rain Queen of her people, was prostrate from illness in her hut one night, when a blazing object streaked across the sky and came to earth only miles from her village. She instructed her women to help her to walk, and slowly the traversed the distance to where the object sat upon the earth. It was spherical light, “sitting like a newborn sun upon the ground.” From it emitted a humming synchronicity. After awhile, a “God” emerged from the bluish light. He was like the shining light, so she could not see his facial features, seeing only the outline of his body. The being raised his hand in salutation to her, and she approached him, leaving her servant women cowering behind her. She was taken into the light with the being. The spherical “star” then rose into the sky and accelerated into the heavens. It is said that at a later time, Queen Numbi did return to her people, with great wisdom to share. Many years after the star object had landed, in this very region of Africa white animals began to be born. These were not albinos, but true genetically white creatures – among them antelope, impala and eland. Some of these with only one horn instead of two, and with blue eyes. There were some white elephants, baboons and leopards as well and. . . the white lions, many with blue eyes! While the other “White Ones” eventually disappeared, the White Lions continued to be born. More recently, it has been discovered that the Timbavati is especially high in radioactivity. It is postulated by Linda Tucker and others that the “star sphere” having landed there may have emitted a strong radioactive field. When I wrote my first article on the Star Lions, I had not yet read Linda Tucker’s book, having only seen her website at the time. I had very much wanted a copy, however, and then a friend let me know that she had a copy of this book (not knowing I even knew about it), and offered to let me borrow it! An intended synchronicity, no doubt. I have written on the Sun Lords of the Telos.Aarkhara as beings with the body of a human and the head of a lion. The lion shaman told Linda Tucker that their “highest gods” possessed the head of a lion and the body of a human being. As Linda points out in her book, the Sphinx has the head of a man and the body of a lion. I find this significant, as the Companions of Horus whom I know of as the Nefer’Ratem are the Guardians of the Sphinx and the grid it anchors in the earth. From my akashic perspective, the sphinx holds one “charge” of a field of light, which is anchored at the other end in the Timbavati. Linda Tucker suggests something similar in The Mystery of the White Lions. The lion priest Mutwa spoke to Linda Tucker about the Abangafi Bapakade – the Shining Ones, who are brilliant leonine ones helping to bring love, light and truth to the humans of our earth. These, I believe, are what Thoth calls the “Sirian Sun Lords” – the Lion-Headed Ones of the Telos.Aarkhara. Mutwa’s own guide and guardian is a being whom I believe is probably an aspect of Sekhmet. Mutwa describes her to Linda as one of the eternal ones working with the evolution of this planet. Not far from Timbavati are the ruins of the ancient city of Great Zimbabwe. In her book, Linda Tucker writes about the connection between the Star Lions and the master builder of Zimbabwe. She entitles this chapter “Great Zimbabwe: Resting Place of the Lion.” The lion shaman Mutwa revealed to Linda that the design of the Great Zimbabwe complex was an astronomically correlated to the Sirian star system. This certainly aligns with Thoth’s revelations to me on the Sirian Sun Lords. In conclusion to Linda Tucker’s chapter on the Resting Place of the Lion, she writes that both Timbavati and Zimbabwe were laid out on precisely the same degree of longitude. . . the same longitude as the Great Sphinx of Giza at 31’14’ east. I was especially interested in the chapter in Linda’s book entitled “Lion Priests and Eagle Shamans.” To the Bushmen, the eagle is venerated alongside the lion. The Zulu would never kill an eagle or a lion, believing them both to be divine creatures of the heavens. Thoth has opened the akashic scroll for me in the past about the “Stareagles” race, whom he also calls the “Shepherds”. These are a branch of the “Solarians” of the Sun Bow Klan. Mutwa told Linda Tucker that he was descended from a “select priesthood” that had its origins with beings of a divine nature named Wandau [lion] and Ntswana [eagle or hawk]. Mutwa spoke of the four steps of initiation for the lion shaman, the fourth stage being the evolution into the lion-eagle/hawk-man-serpent identity, the “Guardian of Sacred Knowledge” known mythologically as the ‘gryphon’. To the indigenous Africans it is the Npenvu – the Beast of Truth. On page 242 of Mystery of the Star Lions, Linda Tucker writes about the “Vitruvian Man” as drawn by DaVinci. She states that this image may have been originally connected to the concept of star gods. I find this interesting, as Thoth guided me to use the Vitruvian Man in the medallion I created from my article on the Nefer’Ratem. The wanton “canned” hunting of the White Lions of Timbavati had eliminated them from the wild until recently. Thanks to Linda Tucker and her colleagues, they are now being reintroduced into protected areas. Linda Tucker summarizes my own akashic perceptions when she writes in Mystery of the White Lions that the white lions are truly radiant beings of light incarnated in lion form that embody the solar logos. The “light fields” of Numis’OM are what Thoth calls the etheric webbing holding together the moving streams of ether into which the New Earth Star, and thus Numis’OM is building, creating, shifting and constantly renewing it’s dimension and substance. In the electromagnetic realm of our current earth, the “webbing” is much denser and more magnetic. This creates a certain stability in what “is” and what “isn’t”. For instance, if you set an apple down on the table, you can be reasonably certain that when you return to it five minutes later, it will still be an apple and not an orange! In such realms as Numis’Om and our own “inner earth”, apples may shift to oranges quite easily, just as an ocean current will take away a palm frond from the beach and replace it with a shell. However, beings who dwell in these realms are equipped with certain crystalline packets in the brain and DNA which allow them to access these changes and move with them in a way that is coherent and productive. This will be a whole topic for an article in the future, but enough said for now, just impart an idea about the light fields of Numis’OM. As the light fields dance. . . expanding, contracting and re-locating, so they create splendorous auroras in the skies of Numis’OM. Beneath these heavenly light shows are sweeping plains surrounded by high mountains. This “reality” is a first level being generated by the light fields. A second or third level would look quite differently. You do not get from the first to the second level by moving through space-time from one point to another. You shift the crystalline patterns in your body. . . and there you are! The first level of the light fields is the region that is guardianed by the White Lions. It is the entry point of Numis’OM. The White Star Lions in the ascended state (of Numis’OM) are truly “Shining Ones” – their whiteness beyond the brilliance we know on earth. Then, all the colors and contrasts of Light in Numis’OM are exceedingly luminous and vivid. I am especially moved to learn from Idoris, the Lion – Headed Sun Lord, that the White Lions who are being massacred for profit in Timbavati are assuming ascended states in Numis’OM as a distinct tribe of Light Beings, working to assist the natural realm of earth in it’s re-genesis. This special “tribe” Idoris calls “Kimbaza.” Among the Kimbaza are those Lion-Ones who incarnated as golden lions carrying the white gene, being also true “Star Lions” under the flesh. The Kimbaza Star Lions hold like a flaming wand, the light of COMPASSION for humanity. . . they who were killed by humans for profit. . . indeed, bred and raised to be released into regions specifically to be killed by the highest bidder. Thoth further enlightened me that this is their CHRISTIC MISSION. . . not only to forgive, but to ENLIGHTEN those souls who partake in such unconscious murder. Just how do the Kimbaza enlighten them? Thoth replied to me that this comes through the dreamstate and through presenting these individuals with life scenarios, while perhaps not pleasant, will nevertheless be instructive! This is the aspect of Sekhmet that the Kimbaza demonstrate to the darker side of humanity. They do this not out of revenge, but LOVE. In Numis’OM there is a Temple of the Lion in which priests and priestesses who maintained such a temple structure in Lemuria and later Egypt, continue this connection to Spirit through the High Deva of the Lion Being. Their ceremonies and rituals are very much attuned to the rhythms and cycles of the Rigel Sun-Star (the sun of the New Earth / Numis’OM), as the Lion IS the natural embodiment of the Solar Logos. The indigenous African name for the Star Lions is “Tsau”, which means “Star Beast”. Thoth tells me that this word is actually ancient Aloii (Lemurian) in origin, and was used to mean both “lion” and “star”. In her book, Mystery of the Star Lions, Linda Tucker tells of a Bushman mother holding her newborn up to the heavens and saying “Tsau, Tsau”, asking the stars to bless her baby with the heart of a lion. Linda Tucker writes that the Lion Priest Mutwa told her that one of the stars in the Belt of Orion was called by his people the “Lion Star”. The constellation of Leo was called the “Exiled Lion.” Thoth relates that the star Denebola in the constellation of Leo is a portal star to the Golden Star of Mazuriel in the attasic (greater, non-dualistic) universe. Mazuriel is the ultimate “Christ Star”, as it radiates the uniting force of this entire universe, drawing it BACK toward and eventually into, the “Higher Heaven” of the attasic. The Temple of the Lion on Numis’OM holds the star grids in it’s light field for the various stars and grouping of stars in the universe which contain the radiating frequencies of the Divine Logos. This “Divine Logos” is contained with the Solar Logos, thus all these stars that are “Lion Stars” are one and the same as being “Christ Stars”. While the Star Lions hold the vibration of the Christic Solar Logos, the unicorns vibrate at the capstone of the Christ Star summit. The LION is the FOUNDATION and the UNICORN is the CAPSTONE. Together they form a powerful union of Christic Spirit for the new light ascension hologram now being evolved on earth — that which Thoth calls the “New Earth Star Hologram.” As Linda Tucker mentions in her book, the lion and the unicorn are often seen together the medieval tapestries and heraldry. Felis Navidad, Maia! FYI-I am so very interested in reading the “Star-Lion” information! Don’t know if you have heard from other readers, but the dark text against the dark background made it hard for me to read every word! Joe, actually I change all my blogs to black text on white. You just need to refresh or maybe recache your page. Hi Maia! I still have to post here the info about alchemy related to this amazing info you share with us (it’s already translated!). Right now, I wanted to share with you the deep connection I had with myself through your video. When you mention the bright crystal at the beginning of the meditation, I saw it in my heart. Then, as you mentioned the white lions on the beautiful garden, I could feel them for real: their fur, even their strong paws as they touched my body, their smell, and of course, the smell of the flowers and the fresh breeze. I had a very deep experience at the Temple of the Lion. I say a black woman with feline face dancing in a hall of an ancient temple carved on stone (as if the temple had been made from an already exitsing cavern). She was dancing there with lights around her, and black men playing drums and flutes. It was a rite of some sort, and she was calling me, inviting me to dance with her. As I joined the dance, I understood the diamond was already inside me, in my cells, spinning faster and faster, changing me. I couldn ‘t understand anything else. It was just a feeling of joy and strength, and a deep knowing that something powerful was happening inside me. As I opened my eyes, three throughts came to my mind: the first one, that the New Earth is already inside me/all of us, because it’s a mental and spiritual state, not only a place. By achieving that mental state, we will achieve the gate that opens that New Earth. The second thought was that at some point in ancient Egypt there was a Sisterhood dedicated to sacred sexual rites, performed by priestesses devoted to the energy of the element earth, and to Sekhmet, and that I was at some point member if that Sisterhood -or at least I attended their rites-. The thrid thought was, if I understood your video correctly, that the future humankind may find its home in Sirius, or in a new Earth, but we might become a “feline humanity”, at least some of us. I do feel this meditation has opened a “seal” that had remained closed inside me for a very, very long time. The black priestess I saw in my vision is still waiting to tell me important things. Thank YOU, Maia, for you are my very own priestess on this dimension.